Campers and counselors travel to Nashoba by bus and arrive at approximately 8:55 am; early morning arrival by car is available after 7:30 am. Lunches are dropped off at the rec hall to be refrigerated, and campers greet one another at their tent areas. Morning assembly is held at the junior, middle and senior amphitheaters for attendance, review of the daily schedule and a lively song or riddle. Three activity periods are held each morning, followed by lunch on the beach at one of many picnic tables on scenic Fort Pond. The afternoon consists of three activity periods followed by closing sing, a snack and a fun skit performed by campers and staff. The buses depart Nashoba at 3:30pm; an extended day program is available until 6pm. Nashoba offers a blend of water and land activities that campers rotate throughout the week. Campers who wish to participate in watersports at Nashoba are required to pass the “Boaters” test. Everyone must wear a life jacket (PFD) while out on the lake in any boat. American Red Cross swimming instruction is offered to boys and girls of all ages from level 1 (beginners) through level 6. We request that everyone participate in swimming lessons through level 5, (swimmers level), and those wishing to go on to higher levels may do so. Swimming instruction is scheduled in the morning and an elective free swim is offered in the afternoon. Campers rotate between swimming in the pool and in Fort Pond. 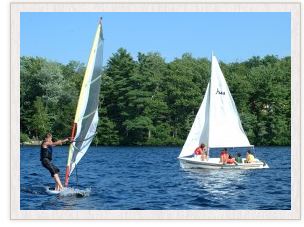 Campers may choose to sign up for windsurfing and additional sign ups are made available daily.